Hi, I am writing in regards to the property at *** Gulf Shore Blvd N #1001, Naples, FL 34103. Please send me more information or contact me about this listing. 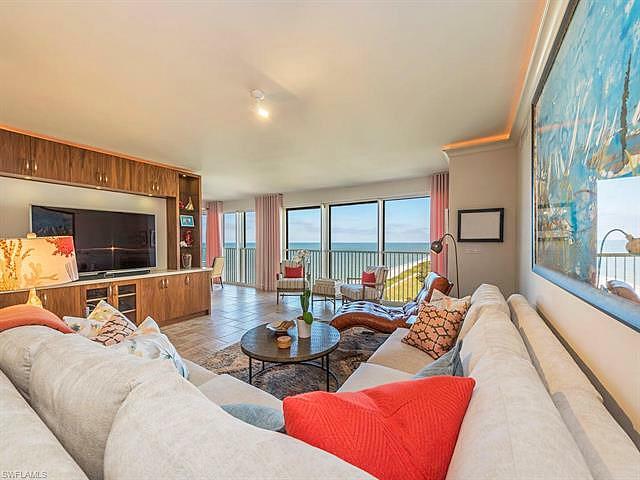 Spectacular unobstructed Gulf views all the way to Sanibel are found in this exquisite, completely renovated 10th floor condo in award-winning Gulf front La Mer. This luxurious unit was finished with the finest high-end materials. A modern, open-concept blends the dining and living areas with the well-appointed gourmet kitchen and stunning views of the Gulf through floor to ceiling windows. The custom built-in wall unit is a masterful blend of form and function. Providing a hidden office, full entertainment center, a wine cooler, along with ample storage for the living area. A split floor plan frames each bedroom suite as a private oasis above the sandy beaches. Enjoy boundless views of the gulf from the master suite, including his and hers walk in closets and a separate tub and shower. La Mer just completed a massive renovation of the building. A plethora of amenities include a fitness center, billiards room, tennis courts, and the beach front pool/spa deck with gas grilling stations. Open-air rooftop sunset/sunning deck accessible by main elevators. Located directly across from Venetian Village dining/shopping and Venetian Yacht Club with boat slips for lease or purchase!This rent to own home is a townhouse or condo located in Naples. It offers in size, 2 beds and 2 baths. Review its detailed information and determine if this Naples rent to own has the qualities you are looking for. Copyright 2019 Naples Area Board of REALTORS. All rights reserved. All information provided by the listing agent/broker is deemed reliable but is not guaranteed and should be independently verified.